Grinding mill plays an important role in the uranium ore processing plant after the crushing process. Construction of the uranium ore concentration plant, and in particular, of the design and construction of the grinding process line is the key for uranium recovery. Wet grinding plant in in-situ leach plant is used to grind the crushed ore grains by means of steel ball mill for reducing the uranium ore fine enough with the consistency of mud. The ball mill, rod mill is utilised as required by production levels and operate in parallel. The high capacity ball mill manufactured by SBM Machinery grinding the uranium ore in a rotating cylinder using large pieces of the ore instead of conventional steel balls or rods. 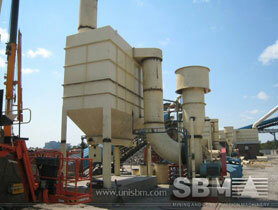 The grinding mill features low consumption, easy operation and so on. "SBM grinding machines have turn out to requires little maintenance and have long wear life."